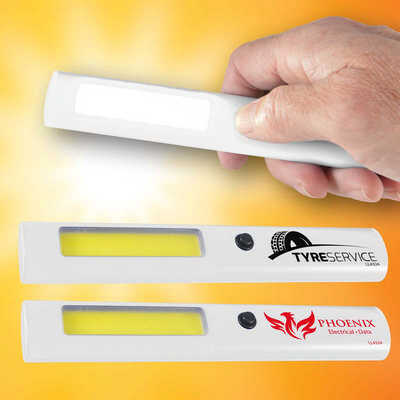 Powerful push button LED (COB) handy torch with magnet for attaching to metal surfaces.COB (Chips On Board) technology produces extremely bright LED light with lower current draw than conventional lighting for longer battery life. Great for emergency use in houses, cars and outdoors. 3AAA batteries included The ideal product for vehicle sales, service and insurance, marine, tradespeople, utility suppliers and house and building contractors. Colours - White Size - 160 x 17 x 27mm (LxHxD) Decoration Area(s) - Pad Print : 55 x 18mm (LxH).